Writer Writer W. James Burns, Ph.D.
Born into a talented family of educators, journalists, authors, editors, musicians and performers in El Paso, Martinez was destined to seek a creative career. “I was always around creative people—people that in my mind made a difference in the world through a personal skill. The only thing I knew to do professionally was fine arts,” she recalls. Martinez’s success is hard-won; she and her husband took turns working while the other went to school. Shortly after graduate school, Martinez achieved a solo exhibition at Scottsdale Center for the Arts, the first of many group and solo exhibitions at prestigious museums and galleries across the nation and in China. A pivotal moment in her career was being selected for inclusion in the State of the Art: Discovering American Art Now exhibition, organized by Crystal Bridges Museum of American Art. 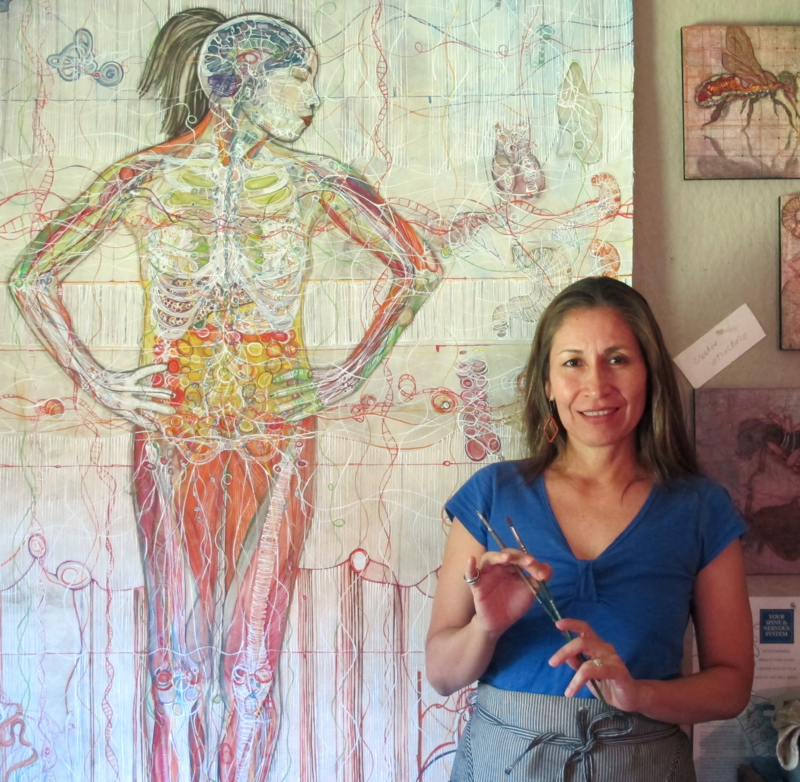 Martinez was selected as one of 100 finalists out of more than 10,000 artists considered. 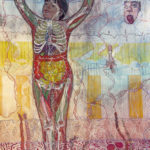 Anatomy, both human and animal, is the focus of Martinez’s current body of work; her creations are like maps of the body. Both of Martinez’s parents worked in helping professions, her dad as a psychologist, and her mom as a speech and hearing clinician who assisted children of varying abilities—a regular topic of conversation around the dinner table in the Martinez home. Differences, her parents taught her, were something to be embraced rather than othered. 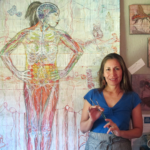 Martinez’s interest in anatomy grew over the past 15 years as she learned yoga philosophy and trained to be an instructor. 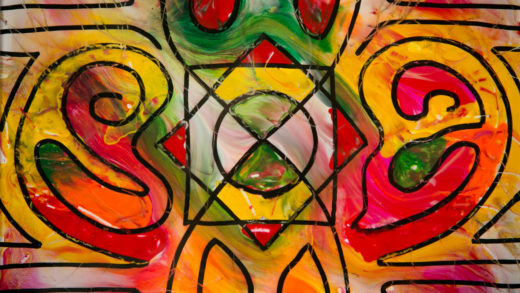 Yoga is the source of the colors for her work, which began small and became larger over time. 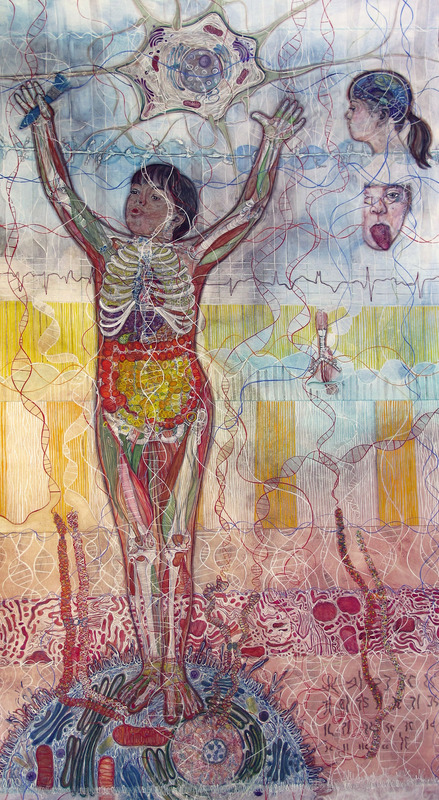 Martinez started with muscle and progressed to bones, organs and finally full bodies; she and her husband were the first subjects. 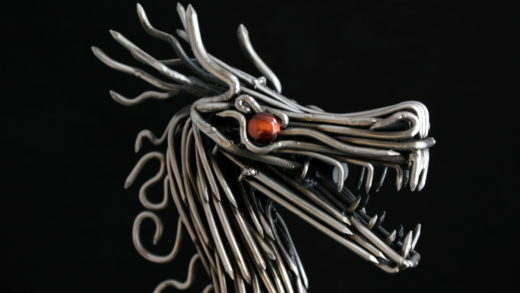 Every detail was meticulously researched; the first piece took nearly a year to create. Inspired by the work of Leonardo da Vinci, Martinez observes: “He created all of the original anatomy work. Everyone should know about him. He should be part of any medical education.” In his spirit, her work inspires questions like: Who am I? What am I? What is the world? What is my relationship to it? The anatomical series began when, by chance, Martinez met journalist and author Amy Silverman and her daughter Sophie. Sophie is featured in Silverman’s book, “My Heart Can’t Even Believe It,” which chronicles the highs and lows of raising a child with Down Syndrome. The book sparked Martinez’s imagination, leading her to ask Silverman if she could draw Sophie. Sophie, a dancer, agreed to pose, setting up her own posture, throwing her hands up in the air for Martinez. Kindling an interest, Sophie led to a series of works. 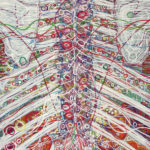 Martinez explains: “The body is like a landscape of intricate structures, complex and full of variety. It’s a whole organization, made up of systems and connecting parts. I find it beautiful and poetic. As I go from shape to shape, work to work, I find myself searching deep within the nooks and crannies. 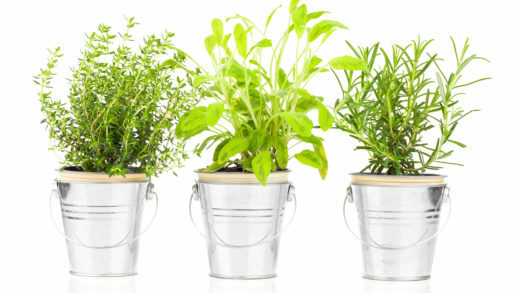 Where is its source? Is there a narrative? Nothing in Stasis is the sixth exhibition at the University of Arizona College of Medicine – Phoenix. It was organized by the UA Program of Art in Medicine, directed by Cindi Standley, evolving from a former partnership between the College of Medicine, Phoenix and the UA Museum of Art in Tucson. Exhibitions presented by the Program of Art in Medicine challenge viewers to explore the range of human emotion and perception. Program director Cindi Standley explains: “Art is good medicine for both the artist and the observer. It is used in the curriculum at the UA College of Medicine, Phoenix to help medical students sharpen their skills in observation and description, foster critical thinking, as well as improve communication skills.” Moreover, the exhibitions help viewers to distinguish between appreciation and preference, and to understand personal bias. The program hosts several exhibitions each year by living Arizona artists. The next exhibition, opening in April, will feature the work of Bisbee artist Sam Woolcott. Hardscrabble Lives: Lessons in Observation is a new body of work, abstracted, layered and deep, containing architectural, mechanical and nautical elements. This work will provide viewers with ephemeral glimpses into the artist’s world. Layers and abstraction create opportunities for deep observation, one of the program’s goals. Woolcott’s exhibition will be followed in August by an as-yet-untitled show featuring the work of Tucson photographer and painter Alec Laughlin, who recently launched a new project focusing on homeless LGBTQ youth in Arizona. The exhibition is part of a research study that also includes video interviews and oral histories, and will feature large archival portraits that portray the youth as powerful and beautiful individuals in need of love and help. I book will be published of the portraits and associated stories. Exhibitions are located on the first floor of the Health Sciences Education Building on the Phoenix Biomedical Campus at 435 N. 5th St. Open hours are 8 a.m. to 5 p.m. Monday through Friday, and the public is welcome. To see additional exhibitions on floor 5, check in with security at the front desk.